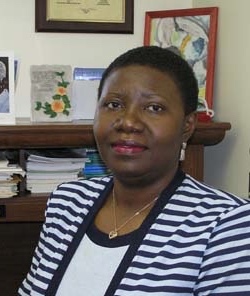 Marceline Egnin is an Ivorian Professor of Plant Biotechnology at the Tuskegee University. She is the Coordinator of the Plant Biotech and Genomic Research Program since 2001 and Co-Director of the Southern AgBiotech Consortium for Underserved Communities Program from 2000 to now. Before that she was Assistant Professor of Plant Molecular Genetics at the Tuskegee University from 1997 to 2000. She earned her Ph.D in Genetics/Molecular Biology in 1992 from Pennsylvania State University.